I saw this recipe on one of my favorite YouTube channels – Texan in Tokyo (rip) and couldn’t wait to try it myself. Ketchup on scrambled eggs is the only way I would eat them when I was a kid – and I still love it. This is delicious and made the perfect “single lady” dinner. In a small to medium pan over medium-high heat, add the fat of choice and cauliflower rice. Add the meat. Dice the carrot and onion and add. Sautee until the carrots start to soften and the onion is translucent. Add 1 Tbsp. coconut aminos and stir. Let cook another minute or so. Add 2 Tbsp. ketchup. Let cook another minute or so. 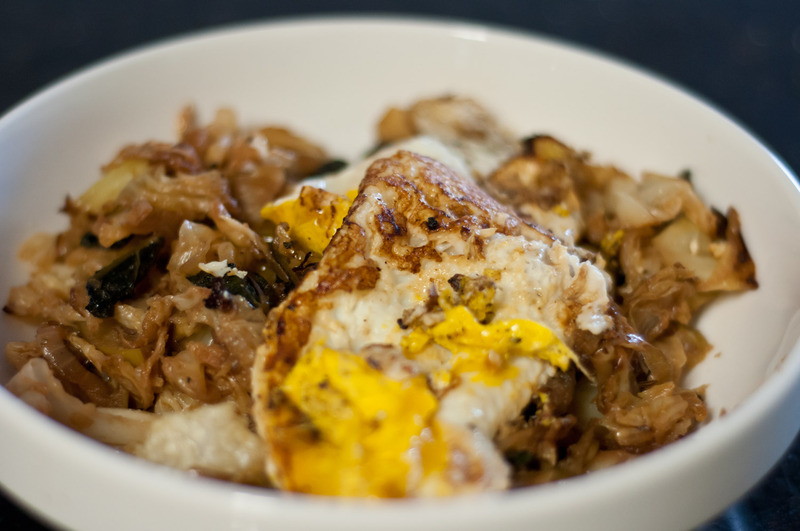 Scramble the eggs with the second Tablespoon coconut aminos. Push all the rice to one side of the pan and add the butter to the clean side. Once the butter is melted, add the eggs. Let set up a bit and drag your spoon through to break up. Let settle into a sort of half omelette. To serve, it would be really awesome to kind of flop the omelette over the rice and serve pretty drizzled with ketchup. Mine looks like dog food. Tasty, tasty dog food. This majesty started with an Instagram shot posted by my brother in law. 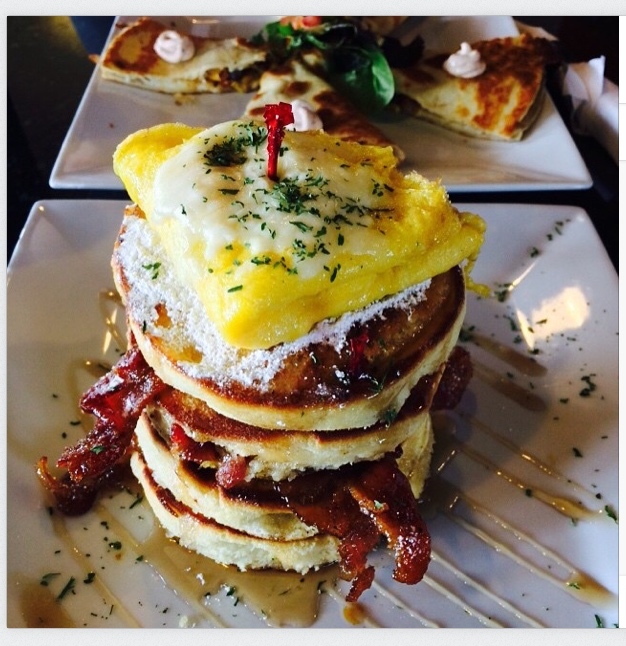 This bananas stack of fabulosity was had at SuperChef’s Breakfast and More, a superhero-themed restaurant in Columbus, Ohio. To say this photo made me jealous is an understatement. I’ve been inexplicably craving pancakes for weeks (I don’t even *like* pancakes generally – sugar is not really my thing), and then this shot came into my life – pancakes where I can replace the syrup with egg yolk. Why didn’t I think of this sooner? In a shower of blessed cosmic benevolence, Lexi’s Clean Kitchen also happened to post a really good looking fluffy paleo pancake recipe around the same time. Call this spectacular convergence divine intervention, synchronicity, or something else entirely – I call it a damn good dinner. And let me just say these pancakes aren’t just ‘as good’ as “regular” pancakes — they’re better. My pancake loving hubby inhaled his (his only complaint was that I used only 1 tsp. maple syrup for the drizzle). I had no idea pancakes could be this satisfying. First, make some quick applesauce. If you happen to have unsweetened applesauce on hand, cool, use that – I did not. Peel and chop your apple. Place in a bowl with 1 Tbsp. water, cover, and microwave on high 4-7 minutes, or until very tender. Remove from the bowl and puree until smooth (I used a stick blender). Let cool a bit before assembling your pancakes. When the apples are coolish, blend 1/4 cup of the applesauce with the almond flour, tapioca flour, 2 eggs, baking powder, vanilla, and a pinch of salt. Whisk to break up any clumps. Heat 1-2 Tbsp. butter in a large skillet over medium – medium-high heat. Add batter by big spoonfuls (small pancake size) and let cook 3-4 minutes until the batter bubbles (just like with regular pancakes). Flip. Cook an additional 3-4 minutes. Continue on. My batch made seven 3-4 inch pancakes. When the pancakes are done, crisp the bacon and fry the eggs. 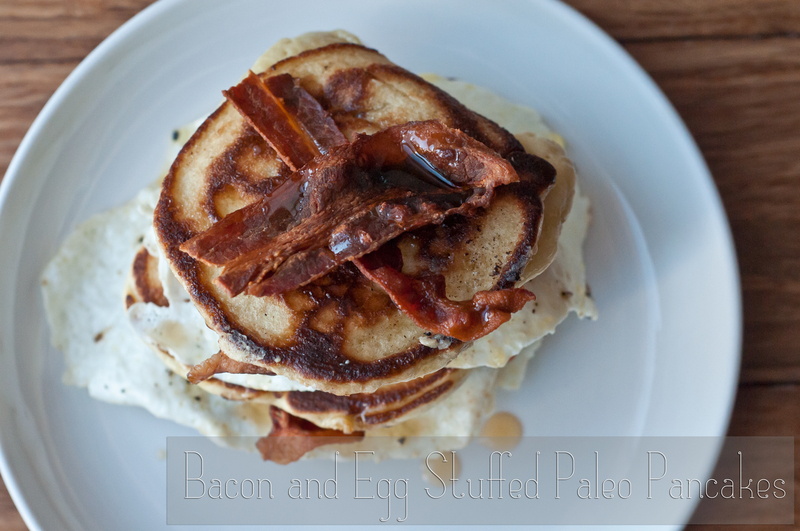 To serve, make stacks: pancake, egg, bacon, pancake, egg, bacon, pancake, bacon & drizzle with maple syrup. This is one of those recipes that started with an idea and snowballed from there. I was reading Shauna Ahern’s post on Gluten Free Girl and the Chef about what salad meant during her childhood vs. what it means now, and was struck with the regional and generational similarities between her childhood idea of salad and mine. For her in California in the 70s, salad meant iceburg lettuce, tomatoes, croutons and Ranch dressing. For me in Ohio in the 80s, salad meant much the same – iceburg, crappy tomatoes, maybe some cucumber if you’re lucky, definitely some cheese, probably bacon bits, always croutons, and a big heaping helping of French or Catalina dressing. Now, for the both of us (and it seems the nation as a whole, by and large), salad means much, much more. I eat some variation on a salad at least once a week for dinner and usually twice or more for lunch, and not even generally a lettuce-based variety. I was also looking for a great quinoa main for the week and the vinaigrette sounded like an interesting new take on familiar ingredients. I stuck mainly to her ingredient suggestions for the ‘salad’ itself, subbing and adding as my pantry allowed. The vinaigrette I didn’t monkey with – over the years I have come to trust her vision regarding taste building (especially with sauces). I’m thinking about possible additions, but nothing is really resonating – I might add some smoke next time through cumin or chili powder because I’m on a smoke kick; but the vinaigrette is great without that note. Rinse the quinoa and add to a medium pot with the stock. Bring to a boil, cover, and reduce heat to a simmer. Cook 15-20 minutes or until liquid is absorbed and curlicues open up. Add your eggs to a small to medium pot and cover with water (cover + 1 inch). Put over high heat and bring to a boil. Boil 1 minute, cover, and turn off the heat. Let sit 8 minutes. When the eggs are cool enough to deal with, peel and cut into quarters. Wash, de-stem and chop your greens roughly. Bring a large pot of water about half full up to a boil. Add a palm of salt and the greens. Boil 5 minutes and drain. In a small dry pan, toast the pine nuts until browned. 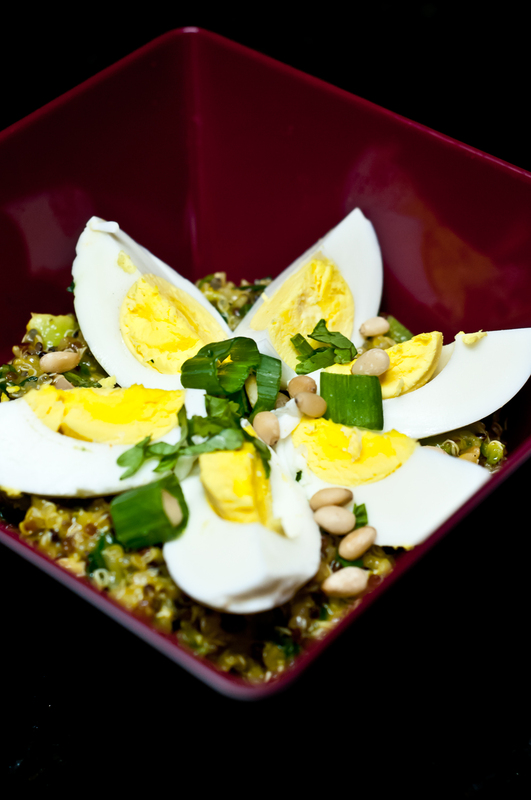 As your ingredients are ready (minus the eggs), add to a large bowl. When everything is there (minus the eggs and avocado), toss to combine. Chop the avocado and add to the bowl, along with the vinaigrette. Toss and taste for seasoning. Add more salt or dressing as needed. Spoon into a bowl and top with egg quarters. This is one of those meals that just tumbled together from different bits and bobs + my sometimes-mantra ‘put an egg on it’. 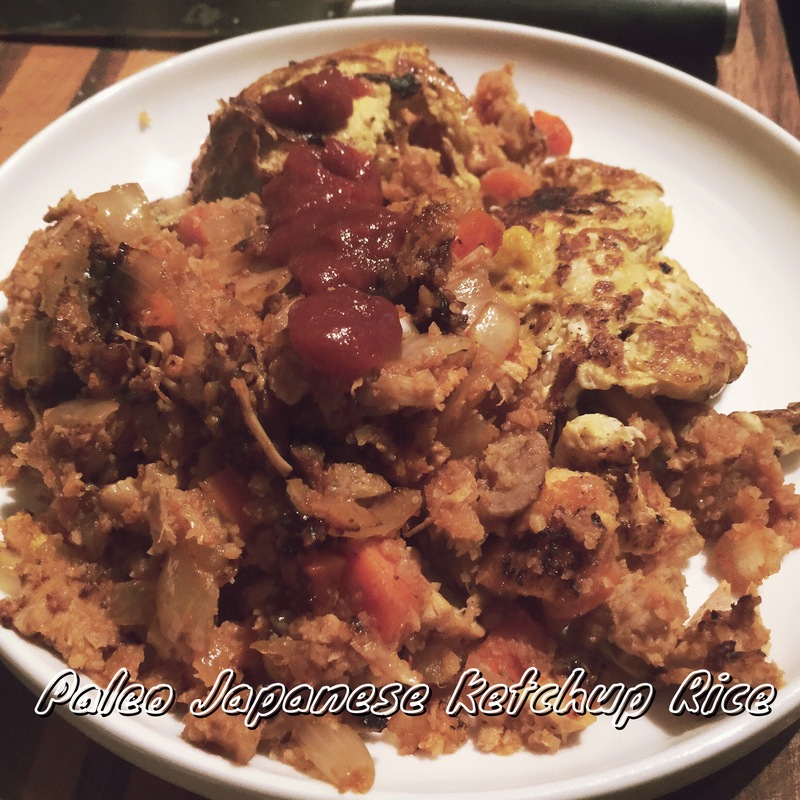 I took a souped-up version of the paleo hash browns from one source, added some leftover spicy/nutty sauce, slapped on an egg (or two), and called it dinner. 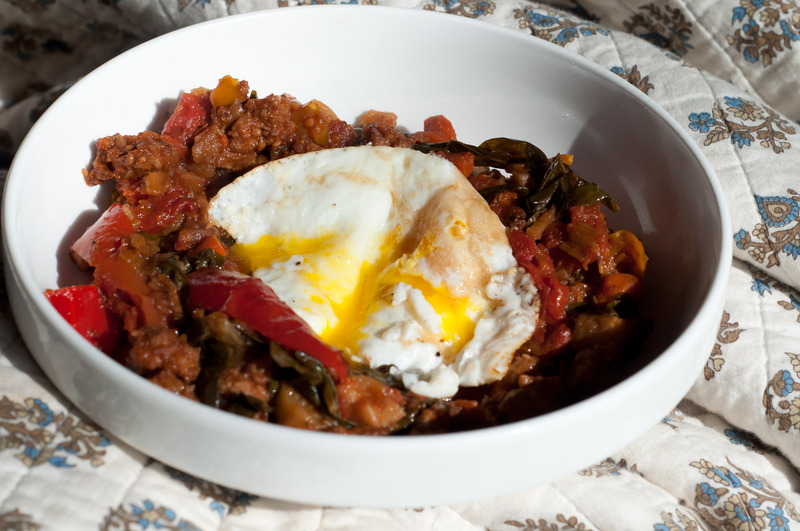 This meal hits the notes for protein, vegetables, freshness, gooeyness, and heat. It’s a winner. Preheat the oven to 450. While your oven is heating, split the squash in half longwise and scoop out the seeds. Rub with olive oil, sprinkle with salt & pepper, and place cut sides down on a cookie sheet. Dice the onion and chop the rosemary. When the oven is hot, put your squash in and roast 20 mins. Flip the squash over and cook an additional 15 minutes. You will know the squash is done when you can run a fork across the flesh and it shreds into threads. Set aside to cool. While the squash is working, dice and fry the bacon over medium heat, setting aside on paper towels to drain when browned. Drain all but a Tablespoon of fat and sautée the onions until softened and just beginning to turn golden. Add the rosemary and salt & pepper. Remove to a large bowl, and add the bacon. Now make the sauce. Bring the water to a boil. While you’re waiting, de-stem and seed the chiles and place in a large bowl. Pour the boiling water over top, cover with plastic wrap, and let sit 15 minutes. While that is going, toast the pepitas a in a dry pan until just beginning to brown. Add to the bowl of a food processor or blender. Chop the garlic and cilantro and add to the pepitas. Add the olive oil, the juice of both limes, and the red pepper flakes. Whiz until a paste is formed, scraping down the sides of the bowl as needed. When the chiles are done, pick out of the water and add to the paste. Whiz until combined. Add 1/2 c. of the chile liquid and whiz to combine. Add the salt and pepper. Taste and adjust seasoning as needed. If your sauce is too thick, thin with a bit more chile water – you’re looking for a hearty sauce; more like a loose-ish paste than a spready sauce. Back to the hash browns. Your squash should now be cool enough to handle. When it is, shred with a fork into the bowl containing the onions & bacon. Mix everything together, salt and pepper if needed, and add the garlic and chili powder. Form the spaghetti squash mixture into small patties (you should be able to get about 9) and fry over medium-high heat in a few Tablespoons fat of choice until beginning to brown on each side. As that is working, fry eggs to your desired doneness in your favorite egg frying fat. Serve hash brown patties topped with a smear of sauce and eggs, 3 per person + 2 eggs. Serves 2 for dinner + 1 for lunch, with plenty of leftover sauce. This is one of those super comforting good for what ails you meals for chilly nights when all you want to do is curl up with some runny egg yolks and huddle under the blankets. It won’t be winning any beauty pageants, but it is warm, filling, comforting, gluten-free & paleo-friendly. In your largest skillet over medium heat, melt 1 Tbsp. coconut oil. Once the oil is melted and the pan is hot, add your cabbage, onion and kale. I happen to like my apples on the disintegratey side, so I added them at this point as well. If you like firmer apples, wait until 5 minutes or so before the end of cooking. Sautee 15-20 minutes, stirring occasionally to avoid burning, until browned and softened. I hit the mixture twice during cooking with the spices and some salt; you might want to add all of it in the beginning. Either method works, just taste as you go. In a separate pan, crisp your bacon. Set aside and add the eggs to the hot fat. Fry till your heart’s content. Serves 2 for dinner or 1 for dinner with 2 lunch portions left over.